Welcome clean lines and contemporary style with this classic recliner that is sure to fit in any home. 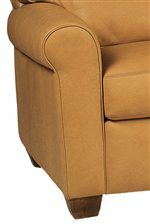 This sofa chair is a push arm recliner with rolled arms with welt cord trim, a comfortable seat and exposed wood feet. Add a modern touch to your living room or family room with this stylish and comfortable high-leg recliner. Choose from leather, fabric, or Ultrasuede® and a variety of color options for a custom look that suits your needs. The Savoy Contemporary High Leg Recliner by American Leather at AHFA in the area. Product availability may vary. Contact us for the most current availability on this product. Arm Flared round arms lined with welt cord trim.